Poste Italiane 3Q18 and 9M18 results on track to meet FY18 Deliver 2022 targetsYesterday the Board of Directors of Poste Italiane S.p.A (or “the Group”) approved 3Q/9M2018 financial results which reflect the positive progression towards Deliver 2022 objectives. Yesterday the Board of Directors of Poste Italiane S.p.A (or “the Group”) approved 3Q/9M2018 financial results which reflect the positive progression towards Deliver 2022 objectives. “Poste Italiane continued its growth trajectory in the third quarter and is on track to deliver the 2018 targets set out within Deliver 2022, our five-year strategic plan built on strong fundamentals and evolving customer needs. “In line with the strategic vision presented at our Capital Markets Day in February, all business segments are contributing to our improved operating performance, driven by low risk growth, reduced reliance on capital gains and greater cost discipline. “In particular quarterly revenues in Parcels increased driven by strong growth in B2C, while our new Payments, Mobile and Digital segment is delivering visible returns in the fast-growing digital payments space with a newly established electronic money institution and an integrated digital payments app. “In light of current Italian macroeconomic conditions we are taking capital management actions to strengthen our solvency ratio while our evolving business model is mitigating the impact of BTP spreads which also create opportunities for us, including higher net interest income. In addition to the standard financial indicators required by IFRS, Poste Italiane also discloses alternative performance indicators to provide a better understanding of the business performance and financial position. These indicators are described in the annex, in line with the ESMA/2015/1415 Guidelines of 5 October 2015. All business segments contributed to growth in Group revenues which reached €2,522m in 3Q18 (+5.3% vs 3Q17) and €7,951 in 9M18 (+0.7% vs 9M17). Mail, Parcel and Distribution revenues for 3Q18 decreased as expected, but were supported by positive quarterly revenues in mail, driven by re-pricing and an improved volume mix with more high value products. Parcel revenues were up 11% for the quarter and 5% for the 9 months y/y, supported by strong growth in the B2C category driven by the growth in e-commerce. The Payments, Mobile & Digital segment continues to deliver tangible results with 13.2% y/y increase in 3Q18 revenues (9M18 +11.4% y/y), driven by a 25% y/y increase in card payments revenues. Financial Services revenues were up 9.3% in 3Q18 and 1.7% for 9M18 with positive contributions from loan and mortgage distribution, asset management and postal savings as Poste Italiane continues to capitalize on its unique distribution network, expanded product range while delivering reduced reliance on capital gains. Revenues for Insurance Services were up 9.0% y/y in 3Q18 and 1.6% in 9M18 mainly driven by increased contributions from P&C and Private Pension Plans, in line with Deliver 2022. Total Operating costs for 3Q18 were stable y/y at €2,066m including higher variable costs of goods and services to support revenue growth. Total Operating costs for 9M18 were down 4% y/y on an adjusted basis1 and are in line with Deliver 2022 targets for FY18. HR costs for 3Q18 were broadly stable, with lower FTEs offsetting higher costs per FTE. 9M18 HR costs are down 2.1% due to lower FTEs. Poste Italiane expects to book early retirement incentives in 4Q18 as part of planned Deliver 2022 initiatives. Group EBIT for 3Q18 reached €456m, up 38.6% y/y. 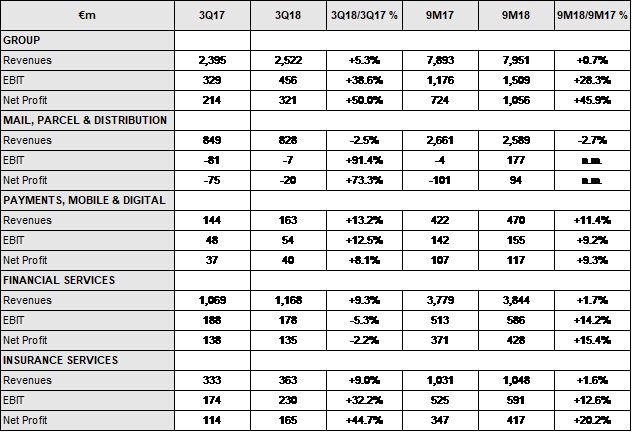 9M18 EBIT reached €1.5bn in 9M18, up 28.3% y/y. Mail, Parcel & Distribution delivered an EBIT approaching breakeven in 3Q18, up 91.4% y/y. This was driven by increasing quarterly mail revenues, growing parcel revenues and ongoing cost discipline. Mail, Parcel & Distribution EBIT for 9M18 was €177m, up from -€4m in 9M17. The Payments, Mobile & Digital segment reported continued EBIT growth, up 12.5% in 3Q18 y/y and by 9.2% for 9M18. Financial Services EBIT for the third quarter was down 5.3% due to one-off costs mainly related to real estate funds provisions. However, on a 9-month basis EBIT was up 14.2%, supported by recurring revenues. Insurance Services EBIT was up 32.2% in the third quarter and 12.6% for the 9 months y/y, thanks to financial margin and P&C contribution, in line with Deliver 2022. For each business segment, Poste Italiane confirms that it is on track to meet 2018 targets within the Deliver 2022 plan. At 30 September 2018, Total Financial Assets reached €513bn, up €7bn from December 2017), driven by €6.8bn positive net inflows from life insurance, mutual funds and deposits. Insurance Products represented €6.4bn of net inflows, of which €0.9bn were unit-linked and multi-asset Class III insurance products. Positive net inflows were partially offset by lower market value of assets. Postal savings net inflows continued to improve, reaching -€4.8bn thanks to new commercial initiatives, boosted by €5.6bn of positive effect related to the accrual of interests on postal bonds. Deposits were up by €4.8bn supported by Public Administration accounts and a resilient retail customer base. Mutual funds posted positive net inflows of €0.4bn thanks to new products offering resulting from our distribution agreements. In the first nine months of the year, retail net inflows amounted to €2.5bn, the best result in recent years. Capital gains and losses – Unrealized capital gains turned into losses. However Financial Services capital gains for 2018 have been already booked and the majority of capital gains for 2019 have been secured. There is therefore no P&L impact from unrealized losses. Higher net interest income – Already earning and will earn higher net interest income from government bond portfolio versus plan as Poste Italiane’s portfolio repositioning at higher yields. Regulatory requirements – there is no impact on BancoPosta CET1 ratio, while the impact on Solvency II is addressed with proactive capital management actions. Including the above-mentioned actions, the proforma Solvency II ratio will be approximately 210% on a fully loaded basis. Further support from the European regulator’s transitional measures is expected upon approval by the Italian regulator. Based on current estimates, the Solvency ratio would benefit by about 20 p.p. resulting in a proforma Solvency II transitional ratio of approximately 230%. Overall Mail, Parcel & Distribution segment revenues for 3Q18 were down 2.5%. Mail Revenues were up 1% in 3Q18 for the first time, thanks to re-pricing offsetting lower volumes, while parcel revenues continued to grow, up 11% driven by strong growth in B2C. Mail Volumes for 3Q18 decreased by 6.5% y/y and 4.3% for 9M18, which is in line with the 5% expected in Deliver 2022. Average price per mail item increased 6 p.p. for 3Q18 as lower margin products such as direct marketing reported the greatest decrease, and recorded mail volumes increased while also benefiting from re-pricing. Parcel Volumes were up 17.2% y/y in 3Q18 and 9.2% for 9M18, as Poste Italiane plays a central role in Italy’s eCommerce market. B2C volumes continue to grow, up 29% in 3Q18 y/y and 24% in 9M18. Growing B2C volumes did cause average price per parcel to decrease by 3% in 3Q18 and 4% in 9M18 due to changing mix in volumes, while B2C pricing remained stable in 9M18 and was up in 3Q18. Payments, Mobile & Digital segment revenues grew by 13.2% in 3Q18 and 11.4% in 9M18. This growth was supported by increased card payments revenues, up 25% in 3Q18 driven by a growing number of PostePay cards and higher transaction volumes in both physical and digital channels. Other Payment Revenues, which includes bollettino, tax payments and money transfers, were up 5% in 3Q18 due to the temporary effect of certain utility providers moving from bimonthly to monthly billing. Telecoms revenues increased by 6% both in 3Q18 and in 9M18, despite an increasingly competitive environment in Italy due to new mobile and fixed line commercial initiatives. The recent launch of Postepay SpA, the company’s dedicated Electronic Money Institution (ELMI), confirms Poste Italiane’s objective of building on its position as Italy’s leading digital consumer ecosystem. Financial Services segment revenues increased by 9.3% in 3Q18 and by 1.7% in 9M18 y/y. Adjusted revenues2 increased by 9.7% y/y in 3Q18 and by 8.3% in 9M18 confirming lower reliance on capital gains and a continued shift towards a more sustainable recurring revenue mix. New and improved distribution agreements are in place with an improved product offering for customers, and continued investment in people and systems. In 3Q18, loans and mortgage distribution revenues were up 38%, postal savings revenues up 12% and Asset Management revenues up 10% as a result of improved distribution agreements and an expanded product range, which are driving renewed commercial focus across all post offices. Insurance Services segment revenues grew by 9% in 3Q18 (+1.6% in 9M18). P&C and Private Pension Plan revenues increased by 50% in 3Q18 (+37% in 9M18) and 71% (+38% in 9M18) respectively, in line with the ongoing diversification of Poste’s insurance offer as envisaged within Deliver 2022. Life insurance revenues also grew by 3% in 3Q18. Total Gross Written Premiums are down by 22% in 9M18, with segregated fund products (Class I-V) down 27%. Unit linked (class III) Gross Written Premiums increased by 27%, while Multiasset products increased by 108%. Gross Written Premiums in Private Pension Plans increased by 1% in 9M18, while in P&C they increased by 36% supported by all business lines: welfare, personal, property and payment. 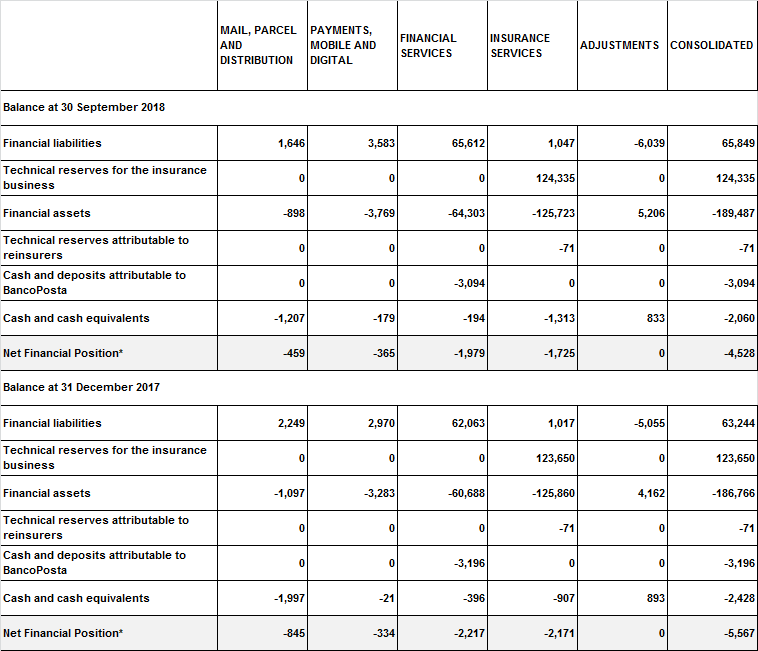 The widening of spread has a further impact on the Solvency ratio of the insurance business (Poste Vita) which registered a decrease to 172% at the end of September 2018 compared to 185% at the end of June 2018 and 279% at the end of December 2017. The reduction is the consequence of the significant reduction of market value of the bond portion of the investment portfolio (€78 bn notional amount of Poste Vita) with a negative impact on Own Funds to fulfil Solvency Capital Requirement. Furthermore the spread has an impact on the statutory accounts of Poste Vita as at 30 June 2018 (in compliance with local GAAP) reporting a loss of about €400 m impacted by the capital losses of the investment portfolio (compensated by the variation of technical reserves under IAS). Considering the evolution of spread, Poste Vita might also report a loss at the end of December 2018; that event did not impact 2018 dividend, which was already paid to the Parent in June. The amount was lower than initially planned, with a positive impact of 3% on Solvency Ratio. Poste Italiane Group constantly monitors the evolution of spread and solutions to mitigate the impact of a further widening are under assessment. Poste Vita is furthermore assessing the possibility to book deferred tax assets on technical reserves related to Class I (amendments introduced by D.L. n. 78/2010) which would result in a benefit of about +8/10% on the Solvency Ratio. Furthermore, Poste Italiane decided to take unconditional commitment in favour of Poste Vita for 5 years for a capital increase up to €1,750 m to support Solvency Ratio, replacing the decision taken in February 2018 (capital increase up to €1 bn conditional to a reduction of Solvency Ratio below 130%). This solution allows Poste Vita, in line with Solvency II Directive and with relevant regulation for insurance companies and subject to IVASS approval, to account for about €1.1 bn immediately as Tier 2 capital (so called Ancillary Own Fund Tier2 or “AOF Tier2”) with a positive impact of about +26% on Solvency Ratio. The above mentioned actions would improve the ratio to about 210%. Finally, further structural measures are under discussion with competent institutions and authorities; among others, on the 31 October 2018 IVASS published “Clarification on the application methodologies of the provisions at article 344-decies of Law Decree 7 September 2005, n. 209, regarding transitional measures on technical reserves to allow for a phasing in from the previous regulatory framework (so called Solvency I) to Solvency II regime. Based on current estimates, the application of transitional measures on technical reserves would positively impact Solvency Ratio by about +20%. Overall, all identified actions would increase the ratio to around 230%. On 3 October 2018, the Company paid the €23 million fine imposed by the Autorità Garante della Concorrenza e del Mercato (AGCM - the Antitrust Authority) following its ruling, in January 2018, that Poste Italiane had abused its dominant market position as per art. 102 of the TFEU. This does not constitute acceptance or admission of liability in relation to the alleged misconduct and does not affect the Company’s right to defend its position. At 30 September 2018, the provisions made in 2017 have been used in full. Following the transfer to Anima Holding of the shares in Anima SGR resulting from the partial spin-off of the assets underlying Class I insurance products previously managed by BancoPosta Fondi SGR SpA, on 24 October 2018 the Company received the sum of €120 million. With reference to the sale of the 100% interest in Banca del Mezzogiorno–Mediocredito Centrale SpA (“BdM”), in accordance with the agreement between Poste Italiane SpA, the seller, and Invitalia, the buyer, signed on 8 February 2017, on 31 October 2018, Invitalia informed Poste Italiane that the Bank of Italy had requested the buyer not to proceed with the reduction of BdM’s capital reduction scheduled for 2018 and necessary to the payment of a €40 million residual consideration. In line with the terms of the agreement, Poste Italiane and Invitalia, acting in good faith, intend to find an alternative method of payment of the relevant tranche of the sale price. In the final quarter of 2018, the Poste Italiane Group will continue to be engaged in implementing the objectives outlined in the five-year Deliver 2022 Plan, approved by the Board of Directors on 26 February 2018. In the Mail, Parcels and Distribution segment, the Group will focus on progressive implementation of the new joint delivery model. It will also proceed with the adoption of new automation technologies to support production processes with the aim of boosting the efficiency and quality of postal services, maximising synergies in the logistics and operations network and leveraging all the Group’s available assets. The Group is also committed to improving its competitive position in the parcels market by taking advantage of the opportunities arising from the growth of e-commerce. In addition, as part of the process of modernising its vehicle fleet, the Group is progressively introducing alternative electric vehicles for parcel delivery (3-wheeled vehicles). This will improve occupational safety and extend the process, launched in recent years, of adopting eco-friendly forms of transport, involving the introduction of a fleet of 4-wheeled electric vehicles. With the creation of the new Payments, Mobile and Digital business unit, the Poste Italiane Group aims to become Italy's leading payments ecosystem, ensuring convergence between payments and mobile technology, and between physical and digital channels, by using its existing assets in terms of expertise, customer base and physical and digital networks. In this regard, following the transfer, pursuant to art. 2558 of the Italian Civil Code, of BancoPosta’s payment services unit to PosteMobile SpA, PostePay SpA was established on 1 October 2018 to operate as a specific ring-fenced entity. As an E-money Institution, the new company is authorised to provide payment services and issue cards. The objective is to be the largest digital payments platform that, operating in synergy with Italy’s most widespread distribution network, will enable Poste Italiane to consolidate its role as a driver of the country’s development and innovation. As well as being a specialist competence centre within the Group, PostePay SpA intends to interpret and lead changes in the habits of consumers and businesses with the creation of new integrated channels, products and services, above all in the fields of acquiring, e-commerce and mobile and digital payments. Establishment of the newly created PostePay SpA forms part of Poste Italiane’s digital transformation in response to a changing competitive scenario in the payments sector, designed to take advantage of the opportunities offered by market deregulation and the changes in progress. The first product to be launched by PostePay SpA, from November 2018, will be PostePay Connect, combining prepaid cards with telephone services. This will be followed by the launch of a Mobile Payments service based on Google Pay. In the Financial Services segment, the Plan aims to take advantage of the opportunities arising from recent regulatory innovations (MiFID II and IDD), taking advantage of the Group’s existing strengths: customer base, distribution network and brand. At the same time, Postal Savings will benefit from the new agreement with Cassa Depositi e Prestiti signed in December 2017. In addition the active management strategy for the govies portfolio is aimed at stabilising the overall return from interest income and capital gains. Consolidation of the partnership with the Intesa San Paolo group will lead to the launch of two new credit protection and insurance products providing protection for the mortgaged properties. Again with regard to loans, the Group’s marketing of residential mortgages under this partnership will again enable to develop a multi-partner strategy, in addition to the existing products offered in collaboration with Deutsche Bank. The PosteVita Insurance Group will continue to offer integrated savings and investment products with the aim of consolidating its position in the life insurance market and boosting sales of insurance products without capital guarantees (multiclass and unit-linked products). The Group is committed to targets for the Non-life business set out in the strategic plan, focusing above all on P&C Insurance and Welfare products. Another relevant target is the reduction of overall personnel expenses, which are expected to fall over the Plan as a consequence of a net reduction of 15,000 FTEs when considering 10,000 new hirings; the reduction in the workforce is due to the initiative launched by the Company in recent years, aimed at accelerating generational turnover through voluntary early retirement schemes. Throughout the rest of 2018, the Group is committed to strengthening its capital structure, with particular attention to movements in the spread and the impact on the Group’s insurance company, Poste Vita. 30 May 2019 is the expiry date of the bond loan issued by Poste Vita SpA on 30 May 2014 for a nominal value of € 750 million with a book value at 30 September 2018 of €756 million. The meaning and the content of alternative performance indicators, not provided for in IAS/IFRS, are described below. These indicators are used to provide a clearer basis for assessment of the Group’s operating and financial performance. EBIT MARGIN: is calculated as the ratio of operating profit (EBIT) to total revenue. NET FINANCIAL POSITION OF THE GROUP: is the sum of financial liabilities, technical reserves for the insurance business, financial assets, technical reserves attributable to reinsurers, cash and deposits attributable to BancoPosta and cash and cash equivalents. 1 Excluding BdM-MCC (0.5 €/m in 3Q 2017 and 34 €/m in 9M 2017); real estate funds provisions (-4 €/m in 3Q 2017, 8 €/m in 3Q 2018, 61 €/m in 9M 2017 and 24 €/m in 9M 2018) and provision for the early repayment of financial products (4 €/m in 3Q 2017 and 16 €/m in 9M 2017). 2 Based on adjusted revenues from capital gains, IFRS 15 effect and MCC-BdM. Poste Italiane reports its quarterly financial reports on a voluntary basis, with a focus on business highlights in compliance with art. 82-ter of the CONSOB Issuers Regulations (as amended by CONSOB Resolution no. 19770 of 26 October 2016), which gives listed companies whose Member State of origin is Italy, the faculty to voluntarily publish additional periodic financial information besides their annual and half-yearly reports. The document containing the Interim Financial Report as of 30 September 2018 will be published by 14 November 2018, made available to the public at the Company’s head office, on the Company's website (www.posteitaliane.it), on the website of the authorised storage system "eMarket Storage" (www.emarketstorage.com), and filed with Borsa Italiana S.p.A. (www.borsaitaliana.it), the Italian stock exchange. The disclosure regarding the filing will be issued in due course. That, pursuant to Article 154 bis, paragraph 2, of the “Consolidated Law on Financial Intermediation” the information disclosed in this document corresponds to the accounting documents, books and records. To see the press release in full version download pdf.